As a business that has over 1000 products lines we have to deal with many graphics. Most of our photos are taken by ourselves and the rest are directly from our suppliers and used with their permission. All too often we come across people who are either very stupid or think they are being very clever or just don’t have clue to the point where they should not be in business, these are the people who steal our copyrighted work from our websites. We get them hotlinking (linking directly to our graphics on their websites and therefore stealing our bandwidth that we have to pay for), using our registered and common law trademarks and directly stealing our photos, text etc and pretending it is their own work or they have permission to use it. The reason for this expose is because we have had enough. There is an online forum based in Australia which has become a hang out for a few Australian nail techs, everyone thought when this forum first started that it would be a good thing, unfortunately there is a gang mentality from some of the members of this forum and every week there is a new target who is berated and belittled both on the forum and off the forum by these gang members, put yourself back into primary school and this is the type of mentality and behaviour that is prevelant on this forum. The forum owner heavily censors the posts and members. There is a bit of history between this forum and BMNE Direct and if time permits I will tell all, but this story is about something different but related to this forum. The members of the gang on this forum say that they are all qualified nail techs in Australia – i.e. they have been to tech school and had training. The nail industry is not regulated in Australia and pretty much anyone can do someone elses nails (but we don’t recommend this). This gang had constant swipes at BMNE Direct and other businesses for selling nail products directly to the public and they could not understand or acknowledge that nail enhancements are purely cosmetic, but their attitude was that we were taking business away from them. They openly supported businesses that only sold to the trade, but the truth was that most of these businesses they supported also sold to the general public and BMNE Direct did obtain proof of this. The forum owner, Georgina Kuhnast, was very loud in voicing her support with her gang members about companies selling to the general public and also sellers on ebay and stated that the products sold on ebay were just rubbish and how businesses like BMNE Direct should be shut down or regulated and only allowed to sell to the trade (so much for competition in the marketplace). The forum owner also claims that she is a qualified nail tech. Around July 2009 it came to light that the forum owner was going to open her own nail supply shop online – good luck to her. She started peddling her wares on ebay – but hang on, aren’t all products sold on ebay rubbish and isnt’ that selling to the general public? So, she eventually opened her own commercial website with only a few products she had imported from China, no brands name and under 10 product lines. A week ago I happened to notice a photo on one of her ebay listings that looked very familiar, upon investigating further I found that it was one of our photos. There was only one other person who had permission to use this photo here in Australia and that was Jahn Acrylic Nail Wholesalers and the owner Lyn, now Lyn and I happen to be friends even though we are in competition and ocassionally we bring in joint shipments of the same product together. 2. Common law trade marks: an unregistered trade mark which has been used (such as a brand name or in advertising) in relation to certain goods or services to such an extent that it is recognised as distinguishing that business? goods and services from those of other businesses. Even though it is not registered, in certain circumstances the law will prevent another trader from using the same or a similar trade mark in a way which is considered unfair. Hi Gina, I could not find the image that I used from my supplier, actually I couldn’t even find my supplier (scary actually) on Alibaba. Anyway, I will give you the benefit of the doubt and will remove my images and replace them with others that I have taken. In future don’t call me to harass me… because that is exactly what it is. You weren’t calm, you were loud and threatening. If you have any further issues you can take them up with my lawyer Vince Cxxxxxx at Cxxxxx & Co on (08) xxxxxxxxxx. I have removed parts of names and email address to avoid spamming issues. OK, so now she is unable to find her supplier. So, she replaced our photo with another she had stolen from somewhere else on the internet without permission from the copyright holder. This is a screen shot of the listing where she was using our photo. Click on the photo to enlarge it to read the elements box. Now, let’s have a look at how we knew this was our photo and she had taken it. The image above is a direct screenshot from her website taken on 9 Oct at 3:00pm, the screenshot also has an Elements Box overlayed into in. To get this you right click on the graphic and view the properties and they come up in a separate elements box. The important thing that we look for here is the name of the graphic and the size. The elements box shows that the graphic is called newnbrush2.gif, the size is 240px X 121px. The name of newnbrush2.gif is the name I personally gave the graphic, our supplier sent us the photo and they had called it newn.jpg, I had to alter the photo, remove writing from it, crop it and resize it and then saved it to our hard drive as newnbrush2.gif. I then sent a copy of that photo to Lyn for her to use on ebay for her listings there and her website. We now know that this ISP is in Adelaide – Guess where Georgina Kuhnast lives – you got it, Adelaide. [30/Sep/2009:18:02:26 +1000] – this tells us that she lifted the photo at 6:02 in the evening. Note the name of the photo in jahnacrylic’s website - newnbrush2.gif. The next line with the ID of 479 is the product id on ja’s website, it says that someone from isp 122.49.158.177 went into product id 479 on jahnacrylic’s website and clicked on “enlarge image” to get a pop up box with a bigger image. “Mozilla/5.0 (X11; U; Linux i686; en-US; rv:1.9.0.13) Gecko/2009080315 Ubuntu/9.04 (jaunty) Firefox/3.0.13″ - this tell us what her operating system on her computer is, now not many people use a Linux operating system, usually it is windows/microsoft, but upon doing a google search we found that Georgina’s husband is a member of a Linux forum. Here is a screenshot, courtesy of Google, of the listing she had on her website on 27 September, it is a cached shot from google. Click on the photo to enlarge it to view the dates. The google link in the top of this image tells us that on 27 Sept this was the photo she was using, so we now had our search parameter dates in which to search the server for when the graphic was taken. Georgina Kuhnast had used a graphic belonging to BMNE Direct Pty Ltd to profit. We are entitled to compensation. Liability, authorisation, penalties, piracy, damages, compensation, court. You can infringe copyright by using someone else’s copyright material without their permission, unless there is a special exception for your use. Using a part of a work can also infringe copyright if is an important part ? it needn’t need be a large part. Even if you change or add to what you use, you can infringe copyright if what you use an important, essential or distinctive part of the original material. A person who infringes copyright can be sued by the copyright owner and taken to court. A court can order a range of things, including that the infringer pay compensation and pay the copyright owner’s costs. In some cases, a person who infringes copyright can be charged by the police, and can be ordered to pay a fine or, in serious cases, jailed. She was sent an invoice from BMNE Direct for the use of that photo for 9 days. Unfortunately it doesn’t stop there. I told her that this matter will be made public. So we are assuming that because she took the graphic from Jahnacrylic’s website that she thought it would be Lyn who was going to make this matter public. Georgina Kuhnast then blocked Lyn, after Lyn had logged onto the forum (leaving a digital footprint with her isp) from having any access to the nail forum website. Now, Lyn had paid Georgina $120.00 for advertising on this forum a couple of months ago and she now had no way of verifing whether her advertising link was still there. Lyn had to write to Kuhnast to request a pro rata refund, which she did recieve. The fact that Lyn got the refund is an admission of the fact that she had blocked Lyn’s access. Later that night Kuhnast engaged one of her forum gang members to start emailing me with stupid requests, why you may ask, they needed to get my isp to try and block me as they now realised that I would be the one to make this information public. Even after all this overwhelming evidence Kuhnast continues to lie about where she got the photo from. 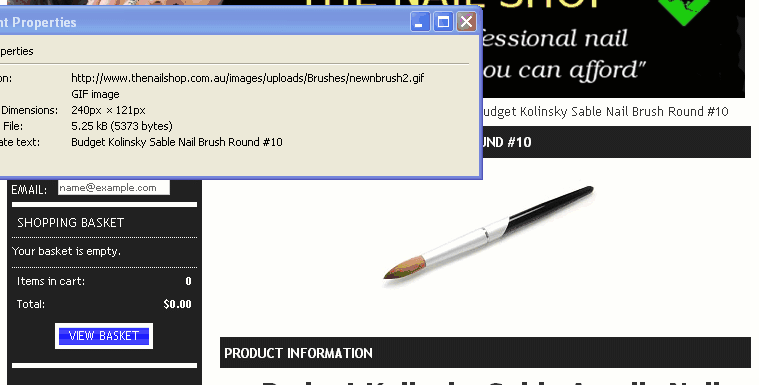 I am writing to you to inform you that I will not be paying you any money for using the same nail brush image that both you and Lyn have displayed on your websites. I have contacted the original copyright owner of the photograph and have their permission to use the same image from the dates you mentioned and from now on. I recommend that if you do have any issues or concerns with this that you contact the company yourself to discuss matters further. What she has done is trolled the internet to try and find “the” photo or one similar. She claims she now has permission to use our photo and yet I don’t recall nor can I find an email requesting my permission to use my photo. And she is still denying that she took the photo from Lyn’s website with the name I gave it. She just doesn’t get it, she stole the photo from Lyn’s website, she didn’t get it from a supplier and I can tell you now Lyn has never supplied her with brushes. … Yes, I am using a different image to the one I was previously using. Below is the image I have permission to use. However, I do not wish to use it as I replaced it with my own images. I think you had better sort this out with the copyright owner. Although, today was their national day off, so you might want to call tomorrow. She claims that it is a National holiday in China on 12 October so I will have to contact them tomorrow – gee, how did she get hold of them on the 12th then? And no, it wasn’t a National Holiday in China on the 12th of Oct, the holiday was at the beginning of October. And, remember in previous correspondence she couldn’t find her supplier let alone that graphic. AND, the photo that she is now claiming she has permission to use is from a supplier that she DID NOT buy her products from. OK, so she eventually did remove our photo and replaced it with another one she stole from somewhere else so why have we made all this public? To warn people about stealing copyrighted material, to warn nail techs in Australia about this forum she runs and to negate the lies Georgina is probably telling her gang members about this incident. There have been many unsavory incidents ocurring from this forum and all of these have involved one or all of the gang members and there are many many businesses and schools in the nail industry, (who have commented to myself) in Australia warning people to stay away and saying they wish it could be shut down, that it is so biased and of no useful purpose to any nail tech in Australia. A classic example of the game playing is from one of the moderator’s on that forum, who posts that she has used a supplier’s products and how fantastic they are in order to engratiate herself with that supplier, when in fact she has never purchased a thing, she also “dobs” on other members to suppliers, example being when one member on this forum was using the word Jelly Tips, she emailed us and informed us, and after we had gotten this person to stop using that name, a few weeks later this moderator is claiming that this girls products are fantastic etc and this is after verbally communicating with me that the products were rubbish and there is no way she would ever use them (oh, nearly forgot to mention, this moderator also works in the same salon as the girl she dobbed in). There was an incident on this forum back in July 2009 where another member had obtained the moderator’s password, got into the moderator’s private messages on the forum and posted them on the forum, these messages were all ridiculing one or another member of the forum. At the time the Kuhnast was most unhappy that this had happened as was telling everyone that the forum had been hacked and enlisting the help of myself and others to track down the culprit. When it was discovered who it was and how they got it, Kuhnast said she was going to the Police – but nothing ever happened, in fact, when she meet the perpertrator at the Sydney Beauty Expo in Sydney in August she stood there having a laugh and a joke with them. But, you have to wonder what they did to this hacker, who was a forum member, to get them to the stage of breaking in to the moderator’s account and pasting it all over the forum to show the forum up for what it is. I look forward to receiving the threats of a libel action against me. What I have posted here is the truth and I have all the evidence to back it up and is my opinion. As a business manager I consider myself to be a professional and I certainly do not want to nor have my business associated with this type of behaviour. From emails and phone calls I have received from other people in the industry, I am not the only one feeling this way about this forum and it?s gang. From the small amount of evidence posted here I am sure you can make up your own mind as to what sort of person she is. Well its about time someone had the guts to show up these backstabbing biatches for what they are, this so called gang are weak little school girls, the Forum that you are referring to is a disgrace to all nail professionals, and the two face person on there known as the one of the moderators well what can I say, just been reading a link in there advertising to buy a book from a nail supplier, this is the same supplier that this moderator was backstabbing, running down and now is her best friend.”PLEASE”, As for stealing photos etc from websites how disgusting, SHUT THIS SITE DOWN. for what I have done, which is nothing!!!! only now and then advertise my products, but I really do not care at all I have better things to do then read all the moderators crap and lies that they write, all I can say is all you nice nail techs out there be very careful because you will be targets one day. You know I sit here and wonder what these people done to a Nail Supplier located in NSW to make her so angry to hack into there website……mmmmmm the mind wonders, well I think I have some idea. So BMNE I totally agree with you I DO NOT want my business associated either with this type of bullying behaviour. And yes Mitzie Girl I agree it needs to be shut down. I too have been to that forum and have seen what happens to people who dont agree with them, wont be going back. From what has been posted here it does show exactly what was done and its such a pity that others refuse to acknowledge the truth, probably too scared in case they become the next target. So sorry you have had a bad experiance too on that forum, I am sure there are many more out there but as you say they are to scared to comment incase they are targeted, which they will be. This blog is run with professionalism, we do not tolerate bulling, and lies. Funny something that could have been so good is ruined by a small gang of bullies. Ms Kuhanst is now trying to play the victim by putting up a thread on her forum stating that she is only human and makes mistakes…blah blah blah. Trust me, the theft of this photo was no mistake and even though she has admitted to this theft by what she posted on her forum, she has not had the maturity or manners to apologise to myself for her unjustified accusations levelled at me during that phone call where I was accused of the behaviour that she was acting out nor apologised for stealing copyrighted property. Further to all of this, her forum admin has been sending a number of people very nasty emails and accusing them of being members on our forum, in particular one member is being stalked by email and now phone by this admin and her family members. Kuhnast is taking potshots at people who are becoming members here and her message to them appears to be one of … if you join that forum (this one) then we don't want you on our forum and will deregister you… again another illustration of the childish schoolgirl menality that reigns on that forum. So apparently if you are a member of that other forum you are not allowed to join any other forum… they think they own you and when they find out you have joined you are targetted. But we have put steps in place here so they can not see who the members are easily and if you want to join us, use another name for a while, and remember you can belong to any forum you want, NO ONE has the right to be bullying, harrassing or stalking you because you want to join other forums… you have freedom of choice and ask yourself do you really want to belong to a forum that does this to it's members? Really bmne THESE LITTLE GIRLS and that's what they are, need to get a life this is Year 7 childish behaviour, the member that is being stalked by email and phone should take it furthur and have them charged with stalking. You little girls need to get a life, grow up, I am sick and tired of all there bulling, who do they think they are, karma will bite them in the ar*e. and bite them hard. So to all you members out there of the other forum watch your back, they will come after you. Only if you knew the crap that has gone on you would be horrified. I wouldn't like to say I was a "victim" of the above mentioned forum, as none can make me a victim. I understand moderating of a forum. I also understand favouritism and making posts lean one way or another. We all have opinions and are entitled to them. To be threatened, when your opinion is not that of a site owner or moderator is unfair. You either prevent people initially with views that do not correspond with your own, or allow people to have their own opinion. Forums should be moderated due to language, offence and bullying of others, not moderated on opinion (or swaying of that opinion), flavour of the month (or favouritism) for that matter. Many choose to feather their own nest. A true forum is not for that purpose, all opinions should be allowed (mature unbiased moderators) should know and notice this. Opinions are not up for argument, they are merely opinions of an individual and should be respected as such. I suppose it depends on what a particular forum intends for it's users. Is the forum for it's members? Or is it for the forum founders own ends? I respect everyone and their opinions, but I am no idiot and will continue to draw attention to the little things that others fail to notice, hoping to open the eyes of others and educate them in an unbiased manner, furthering their education based on my own experience, rather than basing my opinion on sales of a particular product or boosting my own ego. I too will probably be banned from another site due to my opinion, but so be it. Hey Carl I agree with everything you have said. I am banned from that site also mainly because I became an admin on this forum during the time the copyright blog about the owner of 'that' forum was started and it caused a 'falling out' (Words of that sight owner) with one of the moderators. To be honest I haven't missed the site because it has just become a market place for people to peddle their wares and for non experienced techs to hand out incorrect advice. Suppliers are asked to sponsor the site by way of a monthly advertisement on the main forum page but then almost every post on the forum is about what someone else has for sale. How is that loyal to the sponsors, I cannot see for the life of me. I know if I was a sponsor I wouldn't be happy about it. BMNE Forum has a forum section for professionals only, we value your advice and opinions and would welcome your input.